As of the first quarter 2015, the amount of money flowing into infrastructure, residential and commercial center projects in the eastern axis of Saigon was estimated at $8 billion, and capital flow is constantly increasing. According to research by Global Integration Business Consulting Company (GIBC), by the first half of 2015 the Eastern region of HCM City (from the Saigon Bridge to Thu Duc and Vung Tau intersection), the capital for construction of bridges, highways, belt roads and arterial roads was estimated at nearly $3 billion. In the housing market, according to the Dat Lanh Real Estate Company, by the second quarter 2015, about 40,000 apartments had already been or will be built (approximately $100 trillion, equivalent to $5 billion). Luxury apartments and houses are mainly in District 2, Binh Thanh and Thu Thiem. Meanwhile, by June 2015, investment in shopping areas in District 2, 9, Thu Duc and Binh Thanh (East Saigon) was rising fast. It is estimated that nearly 300,000 m2 of new commercial floor will go into operation in 2015-2018, of which Vingroup accounts for two-thirds of the retailing area. With the average construction unit price of $300 per m2, an estimated $90 million is invested in this segment. According to Nghia, the Eastern axis’s advantage is the formation of a metropolitan belt of trade and services thanks to the synchronous investment. Therefore, the growth of this area can last 5-10 years, even 20 years. Lecturer Ngo Dinh Han from the University of Economics Ho Chi Minh City said that $8 billion flowing into the eastern axis of Saigon would not be the final figure. This area has several factors to absorb larger flows of capital in many diverse segments of the real estate market. “From $3 billion capital for infrastructure has led to $5 billion in housing, and the capital flows are still creeping into different types of real estate: trade, services, education, entertainment …” he said. The expert pointed out a series of reasons why the money is flowing to the eastern axis of HCM City. Firstly, the urban-oriented development is in the east, south and northwest and the East has an advantage thanks to its adjacent position to the center, just across the Saigon river. Second, transport infrastructure connected to the inner city and the East has been completed such as Saigon River Tunnel, Thu Thiem Bridge 1, Saigon Bridge 2, and the upcoming Thu Thiem Bridge 2. 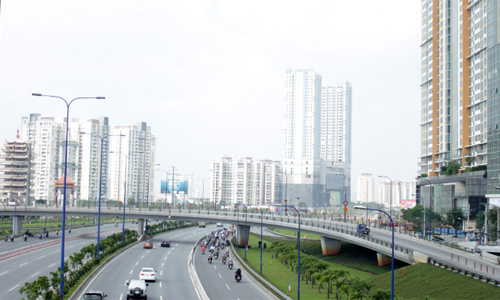 Intra-transport infrastructure system in the East is mainly completed such as the main roads of Mai Chi Tho, 25B, Ha Noi Highway, the inner ring roads, the remaining roads are clear. The Saigon – Long Thanh – Dau Giay highway was also completed and put into use. Third, in terms of location, the East has a strategic location as the gateway of HCM City and southeastern provinces, the crossroads of inter-regional roads of the city and other provinces. Fourth, the East is the highlight of new development, with complete infrastructure, spacious roads convenient for those who travel by car. Once the Ben Thanh – Suoi Tien subway is put to use, it will attract huge population. In addition, the financial district of Thu Thiem is being completed, and the implementation of great projects as Sala Urban Area and Vinhomes Central Park will also entail neighborhood development. Fifth, the price for land and estate in East Saigon is very soft compared with growth potential. He said that $3 billion investment in infrastructure is not enough because the East needs many roads connecting to the main traffic axis. Meanwhile, 300,000 m2 of commercial floor under construction seems to grow at a rapid pace. Investment in this 300,000 m2 may lead to oversupply. For the $5 billion in housing projects in East Saigon, Quang said that the money should be invested in projects of different segments, not only luxurious apartments.